Master paintings, the great ones of which Clara Serena is well within the upper ranks, change as they are seen over the decades of one’s life. We experience great works of art differently when we are older than when we first encounter them as youths. They become fuller, more complex. When I first began sketching out the workshop, Painting Clara Serena | toward a professional painting practice, I knew that it would be a significant, perhaps impossible, challenge to simultaneously explain and demonstrate while painting off to the side of my easel (how else could I present the painters’ view to the camera) the highest achievement of portrait painting in Western Art. 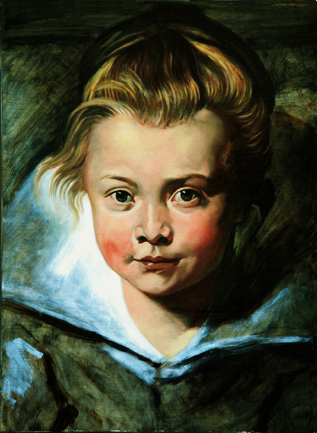 Clara Serena rests above Rubens’ ouevre, he neither equaled nor surpassed this personal expression of love of both painting and his daughter in his long and very productive career. Studying and copying master works is the most efficient training that one can pursue: beginners can be assured that they are on the right track and not being led down a garden path to a dead-end, and advanced artists will discover deeper layered meanings and techniques. Learning to mix flesh tones and harmonizing the figure/ground relationship into a dynamically rhythmic whole is a skill than can be readily acquired and is comprehensively taught in this workshop. Mixing accurate flesh tones is one of the most important tools of the portrait painter’s trade. However, there are good tools and poor tools. An often taught practice for harmonizing the figure/ground relationship is to add flesh hues to the background (this is the ground, the figure is self-explanatory). Yes, this does do the job but it is a cheesy method that drags and muddles the rhythms within a painting. To put it bluntly: hacks seek out the easy path; artists explore the possibilities of color and composition. The tragedy is that many painters strive to seek out the better practices but are stymied by the lack of cohesive training. Most acquire their painting education piecemeal, whether it be a disjointed series of workshops or a 1 hour video that offers a few ‘tips’, the unfailing result is a piecemeal understanding. Hardly a sound foundation upon which to build your career. There are two components to building your foundation: The first is knowledge-based, the nuts and bolts of terminology (whose sole purpose is the expression of implied intentions), color and composition theory, anatomy, pigments and mediums, etc. The second is the practicum. This is your studio work where you digest and put into practice your acquired knowledge. Without a succinct structure, however, most art students will flounder at their easel. The purpose of a sound foundation in drawing and painting is to give you the means to steadily push back the limits of your ability much like an athlete trains to run faster and jump higher. Acquiring your painting knowledge by bits and pieces does little to improve your ability. The abstract structural patina of a portrait painting is a sculptural process of brush work. Greater mileage is attained by a sympathetic brushwork that carves out the figural forms and ascribes a sense of three-dimensional effect. 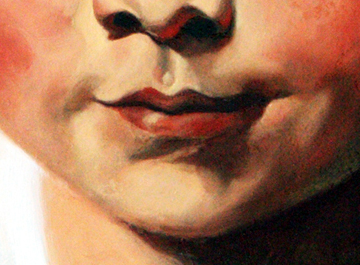 A keen knowledge of anatomy is indispensable to articulating subtle expressions of the portrait. In this still-early development of my overpainting I can see that the expression of the smile requires softening. To do this the Incivisus Labii Inferioris muscle needs to be relaxed and carry less of a hard edge. The reflected light on the lower right jaw is the underpainting. One does not need, nor should they, rework the entire surface of the canvas in the overpainting. Painting Clara Serena is structured to be studied by first watching how I approach, discuss and develop each part of the painting process in manageable 30-minute segments. Your painting then progresses in concordance with mine. In putting together this workshop I decided to include the entire painting process  both the triumphs and those moments of despair when the painting threatened to get away from me. The real learning experiences are found in those difficult passages; it is one thing to watch brilliant painting when things literally snap together, it is quite another to see how one can get boxed into a corner and then work their way out of it. That is a big part of the painting process, there are always obstacles and challenges to overcome. Painting Clara Serena | toward a professional oil painting practice begins with an historical introduction to the painting and follows with a discussion on the materials of oil painting and their preparation. The preparatory drawing (this is the ‘cartoon’) is demonstrated step-by-step. You should, however, have experience in portrait drawing and a knowledge of facial anatomy. Once the cartoon has been transferred to your panel I will teach you how to prepare a distemper imprimatura. And then we begin step-by-step with the optical grisaille which is our underpainting. In the Abbozzo, this is the initial 'dead' coloring, I teach you how to mix flesh tones and key and ‘spot’ them into place. The theory of ‘spotting’ is simple enough: as a form turns in space its surface values, tones and shades must correspond to the planar transitions. The practice of ‘spotting’, however, can only be learned by carefully watching how it is done. The Overpainting pushes up the chroma and values of the flesh tones while simultaneously correcting and refining the drawing aspects and, all the while, articulating delicate anatomical forms with an abstract structural patina of descriptive brush strokes  this is what charms and enchants the viewer. For the beginning painter Clara Serena constructs a solid foundation upon which to grow as an artist. As I mentioned previously, you cannot build a foundation upon bits and pieces of painting tips. Doing so only ensures that you join the long queue of the blind leading the blind. A painter’s career begins with the uphill climb of acquiring the skills, knowledge and perception of art making. But at some point every painter’s development will plateau and further progress becomes an arduous and painful slog. However, this is not the case for the self-taught, untrained artist. Their journey seldom progresses beyond the base of the mountain. They travel in circles. When slogging through the plateaus of a painting career the artist who is honest with themselves will realize the need to strip down their painting practice and rebuild it in much the same way a mechanic will take apart an engine. For the advanced painter stripping down means returning to the masters for a renewed and deeper understanding of what is possible. 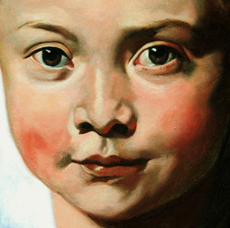 Rubens constantly returned to the reinvigorating well of Titian and Giorgione; Velazquez, Goya, Manet, Degas, Sargent and all of the great artists sought succor in Rubens. Painting Clara Serena | toward a professional oil painting practice is a 13 hour workshop that first builds your foundation in portrait oil painting and remains a constant companion that you can return to for as long as you pursue painting which, I hope, is for the entirety of your life. Painting Clara Serena is now available as an instant video download. The first part is the preparatory drawing and underpainting; the second features the abbozzo (which is the initial coloring in and building of the forms; the third part features the overpainting (this is the brushwork that articulates the forms while enchanting the viewer). Painting Clara Serena | Learn to paint portraits in oil . Only $127! Copyright © 1998-2018 Artacademy.com. All rights reserved.